On March 2 (less than a week ago as of this post), Docker announced the release of Docker Enterprise Edition (EE), a new version of the Docker platform optimized for business-critical deployments. As part of the release, Docker also renamed the free Docker products to Docker Community Edition (CE). Both products are adopting a new time-based versioning scheme for both Docker EE and CE. The initial release of Docker CE and EE, the 17.03 release, is the first to use the new scheme. Along with the release, Docker delivered excellent documentation on installing, configuring, and troubleshooting the new Docker EE and CE. 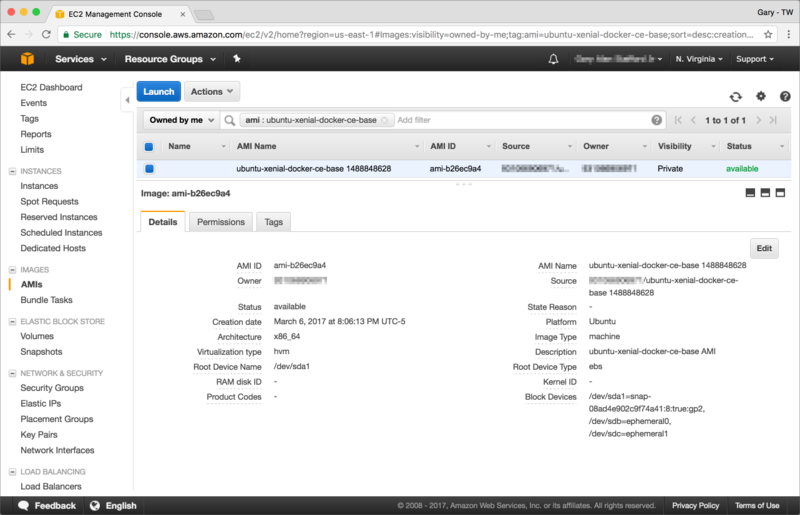 In this post, I will demonstrate how to partially bake an existing Amazon Machine Image (Amazon AMI) with the new Docker CE, preparing it as a base for the creation of Amazon Elastic Compute Cloud (Amazon EC2) compute instances. To provision a small EC2 instance in Amazon’s US East (N. Virginia) Region, I will choose Ubuntu 16.04.2 LTS Xenial Xerus . According to Canonical’s Amazon EC2 AMI Locator website, a Xenial 16.04 LTS AMI is available, ami-09b3691f, for US East 1, as a t2.micro EC2 instance type. The Packer file uses Packer’s amazon-ebs builder type. This builder is used to create Amazon AMIs backed by Amazon Elastic Block Store (EBS) volumes, for use in EC2. This script closely follows directions provided by Docker, for installing Docker CE on Ubuntu. After removing any previous copies of Docker, the script installs Docker CE. To ensure sudo is not required to execute Docker commands on any EC2 instance provisioned from resulting AMI, the script adds the ubuntu user to the docker group. The bootstrap script also uses systemd to start the Docker daemon. Starting with Ubuntu 15.04, Systemd System and Service Manager is used by default instead of the previous init system, Upstart. Systemd ensures Docker will start on boot. Before running Packer to build the Docker CE AMI, I set both my AWS access key and AWS secret access key. The Packer file expects the AWS_ACCESS_KEY_ID and AWS_SECRET_ACCESS_KEY environment variables. ubuntu-xenial-docker-ce-base output will be in this color. ==> ubuntu-xenial-docker-ce-base: Connected to SSH! ubuntu-xenial-docker-ce-base: ca-certificates is already the newest version (20160104ubuntu1). ubuntu-xenial-docker-ce-base: apt-transport-https is already the newest version (1.2.19). ubuntu-xenial-docker-ce-base: curl is already the newest version (7.47.0-1ubuntu2.2). ubuntu-xenial-docker-ce-base: software-properties-common is already the newest version (0.96.20.5). ubuntu-xenial-docker-ce-base: 0 upgraded, 0 newly installed, 0 to remove and 0 not upgraded. ubuntu-xenial-docker-ce-base: 0 upgraded, 4 newly installed, 0 to remove and 0 not upgraded. ubuntu-xenial-docker-ce-base: Need to get 19.4 MB of archives. ubuntu-xenial-docker-ce-base: After this operation, 89.4 MB of additional disk space will be used. ubuntu-xenial-docker-ce-base: Selecting previously unselected package aufs-tools. To confirm Docker CE is installed and running, I can provision a new EC2 instance, using HashiCorp Terraform. This post is too short to detail all the Terraform code required to stand up a complete environment. I’ve included the complete code in the GitHub repo for this post. Not, the Terraform code is only used to testing. No security, including the use of a properly configured security groups, public/private subnets, and a NAT server, is configured. Below is a greatly abridged version of the Terraform code I used to provision a new EC2 instance, using Terraform’s aws_instance resource. The resulting EC2 instance should have Docker CE available. Owner       = "Gary A. Stafford"
Docker EE and CE represent a significant step forward in expanding Docker’s enterprise-grade toolkit. 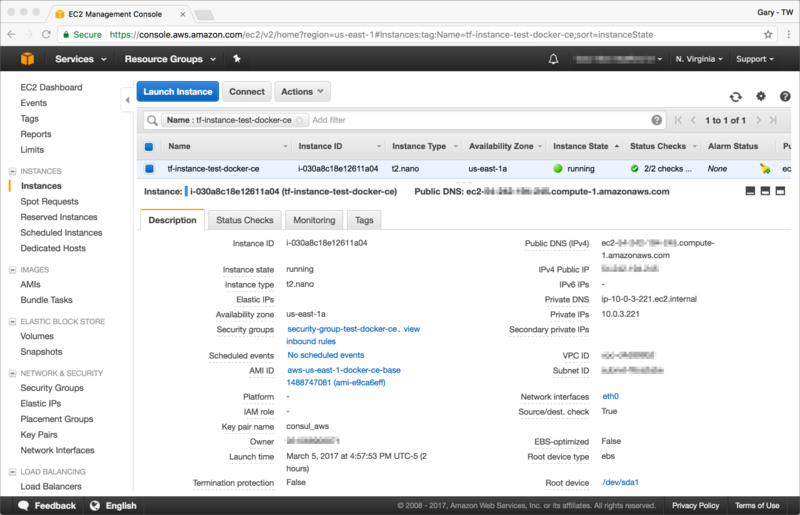 Replacing or installing Docker EE or CE on your AWS AMIs is easy, using Docker’s guide along with HashiCorp Packer. All source code for this post can be found on GitHub.